It isn't uncommon for a reader to see something on DailyTurismo and say "what am I looking at?" because that's the way we like it around these parts. But today, I'm asking that question because I can't tell if this next thing is a functioning auto or a trailer or a home...or...? Whatever it is, I'm getting hungry. 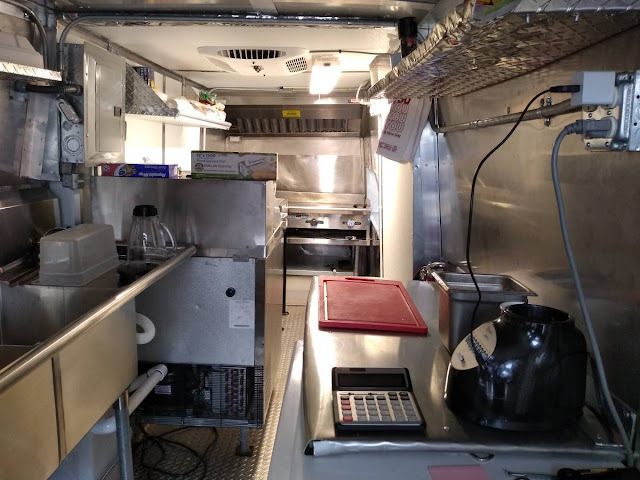 Find this 1971 Ford Econoline Food Truck offered for $18500 in Columbus, NE via craigslist. Tip from Taylor. It says it passed inspection. Is that from the DMV or the Health Department? This is probably the most hilarious "vehicle" (or "kitchen") I've ever seen posted here. I can't stop laughing. Seriously. So many questions. 1. Had they not thought of vending out of the back of the van instead of the front? 2. How does this van move? I'm assuming the drivetrain is gone and besides, how would you see to drive? 3. Why use a van at all if you're going in this direction? Why not use a shed or shipping container? 4. Is this eligible for LeMons racing with a few modifications? 5. Can someone just buy this and bring it to LeMons for food vending? That's less of a question and more of just a plea to anyone out there. 1. Are the cinder blocks included in the sale? 2. I can't tell from the outside, what kinds of meats are available in the tacos? 3. Is this actually just the byproduct of a van crashing into a taco stand and both owners just saying "f*@k it!" and walking away? 4. What kind of mileage does it get? 5. Does the added taco stand affect the van's handling? 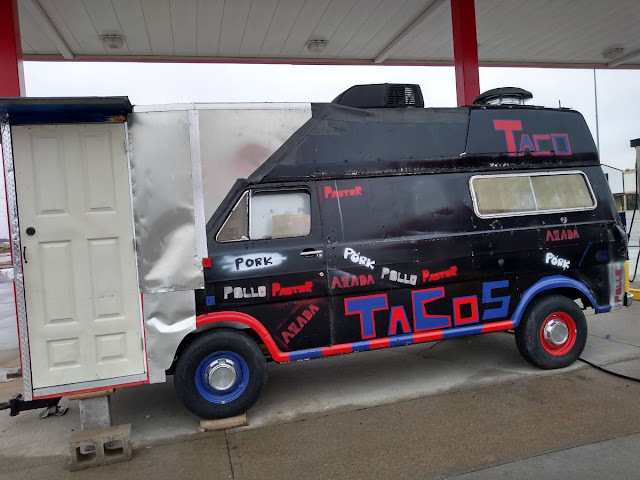 I want to buy this, change the black paint to orange and start a business called "Uncle Rico's Tacos". Park it at Coachella or Burning Man and watch the cash roll in. So it's now FORD (Food On the Road Dead)? Well if you don’t wash your hands, who knows what you might be transmitting. Top Gear (Amazon) needs to buy this. Jeremy Clarkson is making tacos inside, and handing them to..
Top Gear Grand Tour, are you listening? Stan -- this is the kind of thinking that every modern TV show needs. Less reality tv, more taco tankers. It has plates and looks like it's at a gas station. It must be drivable. I just don't know how. Someone needs to check this out and report back. I think that's a hitch on the front and it's pulled with a tow vehicle. Thank you DT. Haven't laughed this hard in weeks. 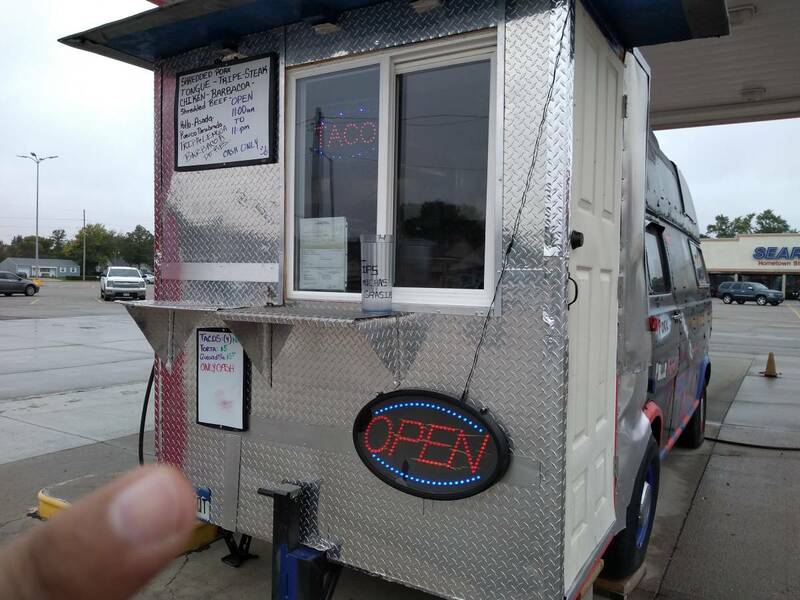 Something tells me that there is some intersection of motor vehicle, building and land use codes that intersect to make this the logical solution to “how do I sell tacos in a parking lot”. Reminds me of years ago when the highway patrol would make the rounds handing out citations for house trailers that had been parked for years for broken taillights and rotted tires.